This is the class that a lot of you have been waiting for! I posted it this afternoon and the first session is just about half full!! I recommend preordering before Friday if you would like a spot! You are going to LOVE this online class!!! *You will need a Big Shot or die cutting machine that works with our framelits for this class. *You will need a Basic Black Ink Pad & the set of 2017-2019 In Color Markers. I’ve added an upgrade option if you don’t own the markers yet! *You will also need adhesive, dimensionals, glue dots, and scissors. **IF YOU WOULD LIKE TO PLACE YOUR ORDER FROM MY ONLINE SHOP YOURSELF (instead of using one of my paypal links) PLEASE USE HOST CODE: CHNKGS9Y AND HAVE YOUR TOTAL BE AT LEAST $50. (I will then just send the class packet and email the online class video. )IF YOU ORDER MORE THAN $150 NO NEED TO USE THE CODE! Please email me after your order so I know that it is for this class! IMPRESSIONS EMBOSSING Folder for Sale-a-bration! (feel free to exchange for another SAB item that will fit in my packaging! *EXCLUSIVE online class video walking you through every card step by step that you can watch whenever, wherever, or as many times as you’d like! 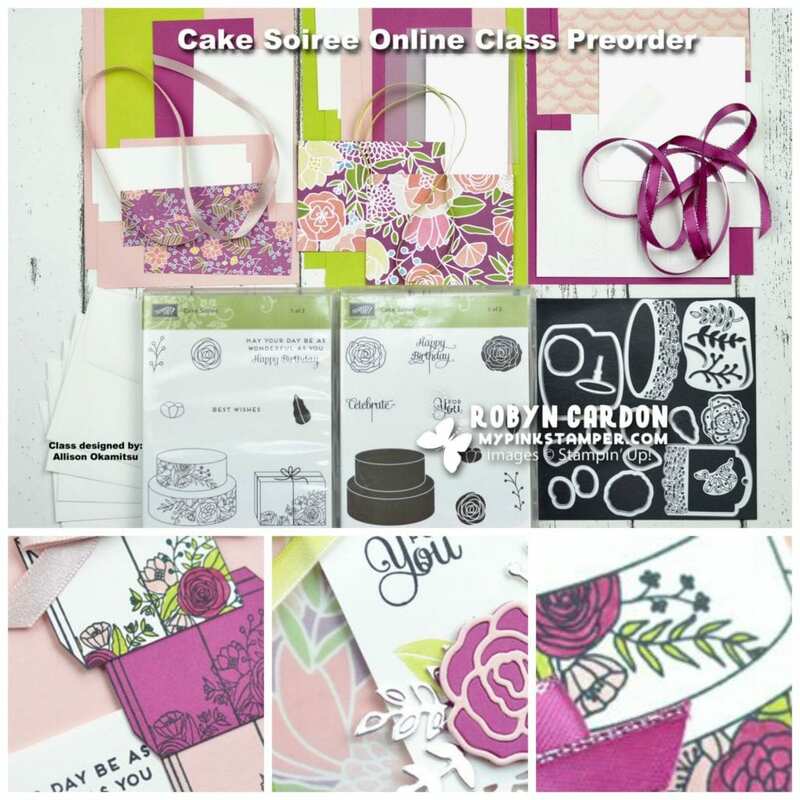 EMAIL ME AT MYPINKSTAMPER@GMAIL.COM TO PREORDER CAKE SOIREE ONLINE CLASS WITH 2017-2019 IN COLOR MARKERS! PLEASE EMAIL ME AT MYPINKSTAMPER@GMAIL.COM WITHIN 2 HOURS AFTER PREORDERING IF YOU NEED TO MAKE ANY SUBSTITUTIONS! You are absolutely going to LOVE these beautiful cards! Class will fill up soon so please reserve your spot asap!! Looks like an awesome class! Need to pace myself! Can’t do them all!